The winter of 2016 was certainly a stormy season here in Tramore. We humans that live here were beyond frustrated, sitting indoors waiting for a break in the rain so we could take a stroll on the beach. For other denizens of Tramore, conditions were more than an inconvenience. In fact, one particular area has been altered beyond recognition. Creatures are struggling to camouflage themselves within their altered environment and even some organisms seemed to have vanished. 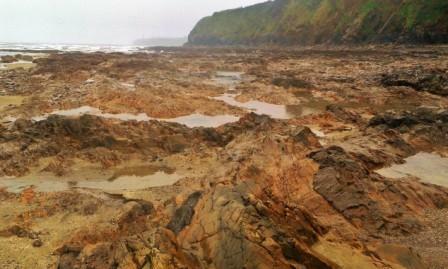 The areas that I’m referring to are Tramore’s rockpools. The above photo was taken just below the splashzone on 20th of February, 2016. 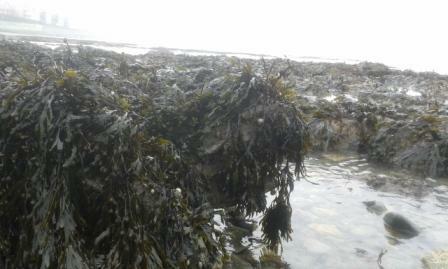 Rockpools of the upper shore were previously edged with a number of species of seaweed including: Wracks (Fucus spp. 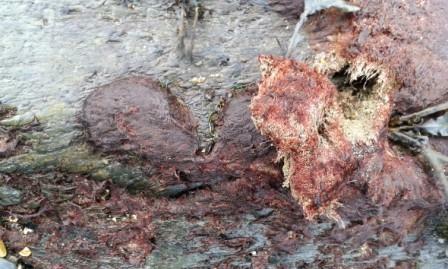 ); Red Seaweeds such as Sand Bind (Rhodothamniella floridula), which can form large, sponge-like mats (see the photo below) that can often completely cover a large portion of exposed bedrock. 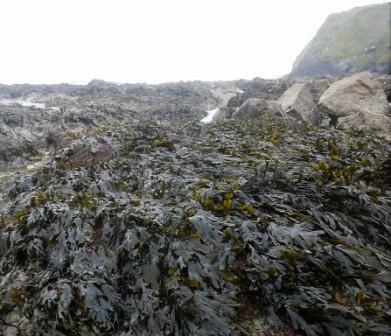 Green Seaweeds were also common, with Gutweed (Enteromorpha intestinalis) being the best known. 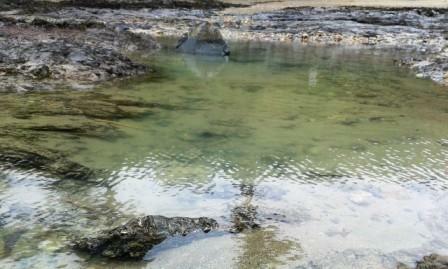 Prior to the winter storms, the pools within the upper shore were biologically much richer than they are right now. The trapped sea water in this pool was previously covered by Wracks and other species of seaweed that spanned out towards the centre of the pool. The seaweed’s holdfasts anchored it to the bedrock and boulders like the ones in the above photo, which cause the fronds (the branches of the seaweed) to fan out over the surface, providing shelter for the wildlife in the rockpools and keeping the water temperatures cool. While this may seem distressing for the upper shore habitats, I see opportunities. Understand that, coastlines the world-over are dynamic environments; changing dramatically over time, and undergo changes that are destructive to the current habitats and infrastructure. These changes provide prospects for organisms to establish or re-establish a currently barren site. Tramore's coast is no different. After all, this isn't the first series of storms that hit our beach! I will also upload photos and provide descriptions and facts of the organisms I come across along my rockpool-hopping campaign! Please, check back next week and I'll introduce you to a rockpool fish that hops...And about a sea-sponge, whose biomechanics are being used to treat cancer.